Superior RF Protection - The CS is designed with superior RF protection to deliver accurate and stable results when used in production areas or near cell phones. Approvals for electrical and emissions include CE listed and FCC Class B Part 15 operation. 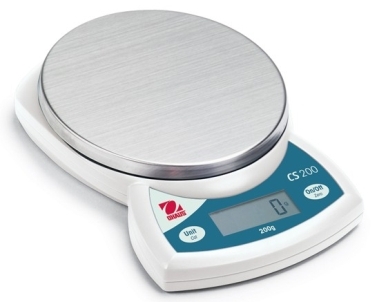 Large Stainless Steel Weighing Platform - The CS is designed with a large weighing platform and can adequately handle large samples including oversized letters. In addition, the standard stainless steel platform is removable for easy cleaning. Compact Design - The CS has a low profile design and is truly portable when powered by three "AA" batteries (included). A standard AC adapter can also be used to power the CS, when used in a more permanent location. Models in this range include the CS200, CS2000 and CS5000.